There is nothing like celebrating the 4th of July with the amazing fireworks displays in Cayuga County and the Finger Lakes Region. Communities across the region pull out all the stops to throw spectacular celebrations of our country’s independence. In addition to the fireworks displays you will find parades and other festive activities happening to make the weekend special. In Auburn you can watch Fireworks at dusk from Emerson Park on beautiful Owasco Lake. The charge is only $5 per car, $1 for seniors and handicapped, totally free if you have a season pass which is the best deal going. Get there early for the patriotic concert that starts the party at 8:00 p.m.
Up on the Great Lake Ontario the small Village of Fair Haven celebrates our Independence all weekend long from Friday through Monday, the party never stops. The Mile Long Parade down Main Street, Arts & Crafts Festival and carnival kick the weekend off on Friday. The rest of the weekend includes a 5K walk/run, wall of fire, fireworks (of course!) and to top it all off a Boat Parade on the Bay, a Fair Haven tradition. Fair Haven is the place to be on Lake Ontario over the Independence Day weekend! 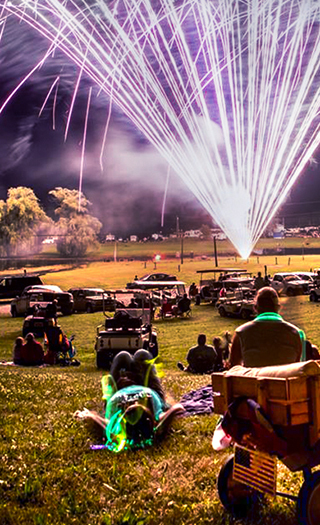 Riverforest Park in Weedsport also puts on a party over the Independence Day weekend with fireworks at dusk on Saturday July 2nd and live music with ‘The Johnny Rage Band” starting at 9 p.m.
On Monday, the actual 4th of July, the Town of Owasco puts on the 90th Community Field Day with their famous chicken BBQ starting at 11:00 a.m. Get there early and get in line for this popular BBQ as when they run out, they run out…. The Parade starts at 2:00 p.m. and wraps up this fun-filled weekend celebration of our independence. And even though the fireworks displays are amazing, there are a whole lot of other activities and entertainment throughout the weekend. Here are a few to check out. Kick off the weekend on Friday evening with music at Treleaven Winery or Prison City Pub and Brewery. Treleaven’s Garden Concert Series features live music every Friday during the summer along with food, wine and craft beer. You can also enjoy a local brew and pub fare at Prison City in downtown Auburn while listening to the band, “Fresh Guac” from 9:30 p.m. – 12:30 a.m. The Sterling Renaissance Festival opens for the season, Saturday, July 2nd. Take advantage of the opening weekend special, buy one adult ticket at regular price and get one ticket half price. Merriment awaits you at the Sterling Renaissance Festival, celebrating their 40th year!